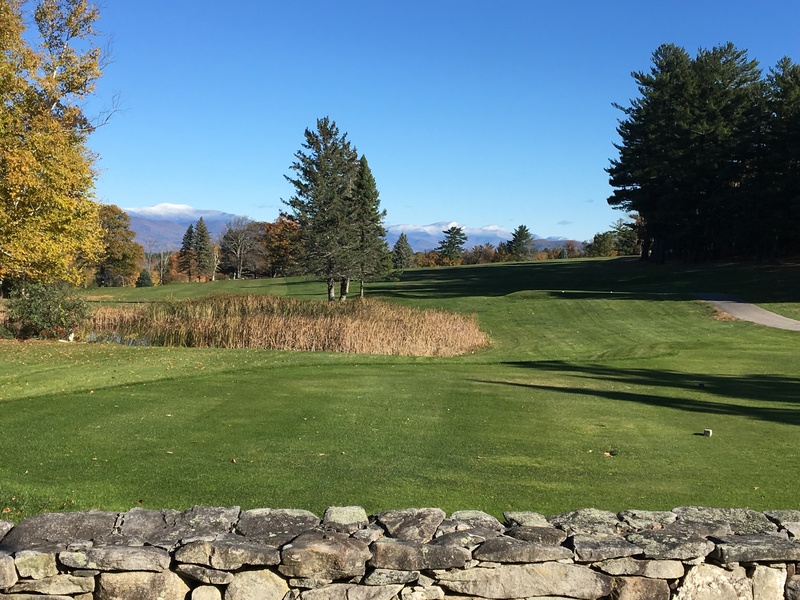 The opening hole at Waukewan offers the golfer a beautiful view of the Sandwich Mountain Range in the distance and you should see from here that the golf course is neatly maintained. Your play off the tee should be biased toward the right side of the fairway as it slopes from right to left. A good drive will put you on either side of the cart path that crosses the fairway in the distance and should leave a 130-150 yard second shot to the hidden green. If you cannot site the flag from your drive, if play permits, you should take a quick look from the top of the hill to get a visual of the green and site your line in relation to the two towering pines in the distance behind the green. This green slopes slightly from front to back and can be difficult to hold if your shot comes in low. You can run your ball down the hill onto the green here but there are no guarantees it will hold. Miss left and you will have a shot from heavy rough. Go long and you will have a bunker shot back onto the green. Miss to the right and you will have a tricky shot from above the green.